If you weren't quite convinced of Cam Newton's star power during his record-breaking rookie season with the Carolina Panthers, this new commercial by Under Armour should finally make you a believer. It's becoming clear that the sportswear and apparel company plans on making the NFL Rookie of the Year the face of its brand. Why wouldn't you, with a 22-year-old, who's built like he was created in a video game, has Hollywood looks, and, most importantly, became the first quarterback in NFL history to pass for at least 4,000 yards (4,051 to be exact) and rush for at least 500 yards (706) in a single season. 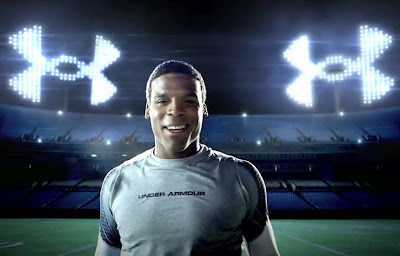 The title of the 60-second spot is "Cam's Night Out." It was filmed at Bank of America Stadium--see, when you're a star, the camera and production crews come to you--as you can tell by the Panther-blue stadium seats. Starring in the commercial with Cam is crazy producer/live beat-maker AraabMuzik. Why? Because the football field/stadium is Cam's club, and Araab is his DJ. It's a creative concept they have going in the commercial. But who knows, it could be truer than you think. Cam is hardly ever spotted at nightclubs in Charlotte, unlike many of the city's other young, rich, professional athletes. It's nothing wrong with popping mad bottles at the likes of Butter and Suite when you make more in a week than most of us make in a year. But staying out of the nightclub and staying in the weight room and on the field seems to be working pretty well so far for Cam. And it's got him starring in one of the coolest athlete commercials I've seen in awhile, which, reportedly, is the first time Under Armour has created a campaign centered on a single athlete. You see Cam perform some ridiculously athletic moves. It trips me out how he dribbles a football like it's a basketball, which you've probably seen him do on occasion. He ends the commercial with his signature touchdown celebration move--the Superman pose, which we hope we see a lot of next fall.